In this tutorial I am explaining the steps to configure Belkin Wireless N router F5D8233-4 by accessing the web based setup page. Though this tutorial is for a specific Belkin router model, you can use the same procedure to setup most of Belkin Router models. This tutorial is for those who want to setup their router manually without running the setup CD from Belkin. If you want to configure your Belkin router by running the setup CD ,click on the link below for instructions. 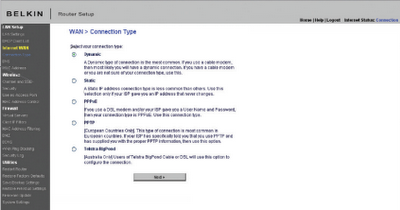 In this page you can see instructions to run the CD and setup Belkin wireless router. However, to set advance settings on your router it is better configure router by accessing the web based setup page and set the settings manually. To access Belkin's web based setup page type 192.168.2.1 on the address bar of the browser. By default there is no password set for the Belkin router and you just simply click submit button to log on to Belkin router setup page. Click on Internet WAN and select the connection type you want. 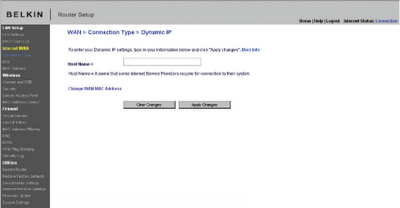 If you have Cable Internet connection, you should select Dynamic IP option. In most cases you may need to type the host name provided by Cable Internet Service Provider. In addition to this to work Belkin Router with cable modem, you may need to clone the MAC address of your computer using the link/button change MAC address. 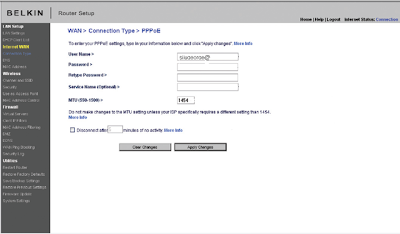 To configure DSL Internet connection you should select PPPoE as the connection type. Here you should enter the user name and password provided by your Internet Service Provider. After entering the details you should click on save settings. Now your Belkin router is configured in PPPoE. In the same way your can setup your Belkin router for static IP and PPTP. You can change the router IP address and you can enable or disable the DHCP function on the Belkin router using this window. By default belkin router IP address is 192.168.2.1 but you can change it to any other valid IP address. To edit the wireless settings, click on Wireless tab in the setup page. You can edit the Wireless network name and wireless channel here. Wireless name (SSID) is the name of your wireless network. The most recommended wireless channel is 6. You can use wireless channel 1 and 11 too. To enable wireless security on Belkin router click on security under wireless tab and follow the instructions in the link below. It is very important that you should update Belkin router firmware after configuring the router. To know how to update the firmware click on the link below. You can select various security settings from the list provided here. 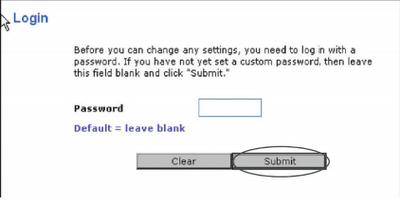 To enable a secured wireless network follow the instructions given in the link. There are some other points you must care after configuring the router. One of them is to ensure the safety of the wireless network. It is a nice practice to enable MAC address filtering in Belkin Router to avoid any unauthorized access to your wireless network. To learn how to enable MAC address filter in Belkin wireless router, please follow the link below. Some users says they were able to access Internet before adding Belkin router in their network. After installing the router, they are not able to go online. If you face such an issue after setup Belkin Router in your network, follow the link below to fix the issue. Nicely Written an article, but if anyone needs any assistance for Belkin Router Issues Use Belkin Router Customer Service Helpline: 1 888 306 5155. Very Well Written article. Full of useful information. These kinds of articles attract people. You did a great job. I m pleased with your and thankful for such a wonderful article. What a great post This is something that people need to understand and follow. Google Chrome is totally free and trusted web browser for windows. It is the best choice when you want a multipurpose tool for web experience. Google chrome is a most popular web browser which is used today in terms of security, usability, privacy. If you have any query related to the chrome and another browser then you can visit us because we have all types of solutions. we provide the best service of the user who is face any problem that is related to the browser so you can contact our team. WOW! It is very helpful for me my friend. Xbox Customer Service I really thankful to you. Thankyou for share with us. WOW! It is very helpful for me my friend. Zohomail Customer Service I really thankful to you. Thankyou for share with us. your article is very helpful. your have a great knowledge about wireless router & extender. Thank your for sharing it with us. Thanks for sharing this great information about detail, i shared this information to my all friends on social media platform because this info helps to everyone. What is special in GemStone - GemFire?